Looking for a fun action puzzle game that isn’t Oceanhorn, or the Legend of Zelda? If your answer is yes, then you’re in luck because this Nintendo Switch has a newly released title that has all of those aspects, but I must say, it does involve elephants. Developed by the one-man studio that makes up Neckbolt (Niklas Hallin,) over two years of development, Yono and the Celestial Elephants is a game that gets rid of your average human protagonist and replaces it with a young elephant by the name of Yono. But just because there is no Master Sword this time around, doesn’t mean you still can’t have a fun adventure! As an elephant, Yono, like all those who came before him, mighty protectors of the world that have been born from stars and while Yono might be young, it definitely won’t stop him from setting out to see the world for himself and do what he can to save it, while learning the history of the world he calls home and encountering the likes of humans, undead bone weights and a robot by the name of Mekani. Still, for a game that only took around 2 years to make, Yono and the Celestial Elephants is without a doubt a game that is visually amazing! Yes, the style may look very cartoony, which at first glance might make you think Yono is a game just for a younger audience, which by the way it isn’t as mature players can enjoy this game as well. Due to the fact that there is a serious undertone, tension of a racial sort between a lot of characters and taxes, but the art style is so beautiful, very detailed and bright, it’s like eye candy for me because it really is just so beautiful to look at and admire. With regards to actual gameplay, although it is very easy to pick up and get the hang of, there are certain things that I feel are missing, such as the ability to change controls and a good combat system, but hey, Yono has a big head and although the headbutts he can do as part of a charging attack are somewhat limited and can be often clumsy as it is very easy to fall off platforms, Yono’s head is great for pushing obstacles out of the way and clearing a path through places, Then opening up new routes to explore and new paths to go down, which can more often or not, result with you encountering some more simple, yet elegant puzzles and rewarding items like life upgrades that can come in handy at times. As well as the puzzles though, some of which are just too short, or way too long as there are many steps involved that trying to remember everything can get very confusing at times, in typical Zelda-lite fashion, there are a lot of side-quests to do, a currency which can be collected, and guess what? Because you will love it, you can get alternate skins for Yono like decorating Yono with stars so as to make him look like a constellation. What’s not to love about that? It’s cute, it’s creative and it can definitely tie in nicely to what really is a simple yet very pleasing charismatic game that instead of having an in your face annoying soundtrack, the background tunes are calm and quiet and just for nearly any occasion. Still, while Yono is a fantastic game, there are of course faults and general things about the game that I did not like. To start, as a game inspired by Zelda, while it is nice to see Yono try to pave its own new path, I would have liked to have seen just a couple more Zelda like touches at play. Also I know Yono is an elephant, but I would have loved it if Yono could move with a little more haste as the big old elephant was a pretty slow for my speed and because of that, I was having to spam the headbutt button just to move a bit faster, which is fine until you fall off the edge yet again and have to respawn. As for another issue, during my play sessions, on two occasions I had encountered an instance where characters would actually move by sliding all over the place and I mean sliding as opposed to moving as part of some odd walking animation. It’s definitely not a game breaker, but it is a weird sight to see and very hard not to notice, much like the glitch with regards to enemies. Sometimes you can be right up close them and use your charging attack, only to have the blow not register as a hit, which again doesn’t entirely ruin the game, but it does mean the enemy can get a decent hit or two on you, before you can even hit them back. What’s worse though, is if you’re low on health and close to dying, than that can be a problem, much like needing to ensure you memorize the game’s controls, because until you get used to it, errors will be made and depending on where you make them, they can either cost Yono his life, or he’ll be perfectly fine, but some adjusting should be required. Not sure if it was something with my Switch but just something that happened during my play sessions. But with glitches and issues aside though, Yono and the Celestial Elephants is a much better than I initially believed it would be, even if it does currently not support the Pro Controller, as an update is on the way. 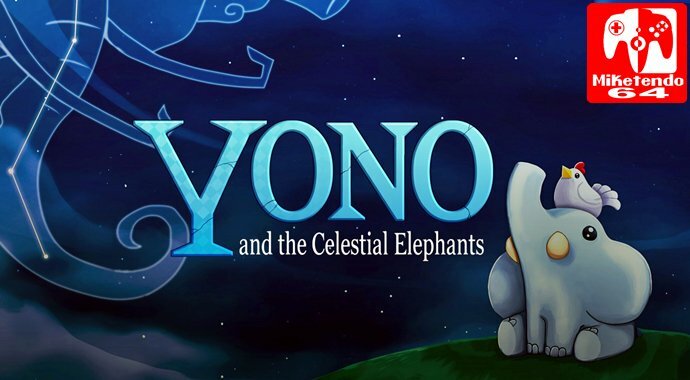 From what I have played, some troublesome puzzles aside, Yono and the Celestial Elephants is a very fun game that can either keep you playing for more hours than you’d intended, or make you rage quit. Either way, with these stunning visuals and very enjoyable gameplay mechanics, Yono is definitely a game that compels you to think inside and outside of the box and even though it does have its flaws such as very small issues and the occasional glitches, the adventure it has to offer truly makes up for it. So on the subject of “would I recommend it to someone looking for an interesting puzzle game?” The answer is a solid yes. At first glance it does look like a game for kids. The graphics are cute and the puzzles are easier than those found in Zelda. I personally enjoyed it though and I am fast approaching forty.